i shot this doe yesterday . 5:05 pm aneewakee adiction recurve 56" ,56#@28 ,beman mfx carbon shaft, magnus 2 blade broadhead. arrow enterd the deer behind the last rib right side, exit just behind the front l eft leg. 100 yrd recovery.
" you have done well to keep your hair when so many are after it"
Congrats again from me too! 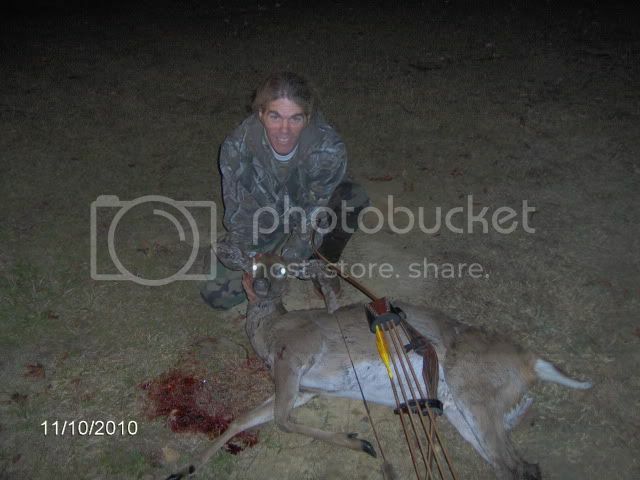 Good shot on a nice doe. Nice bow you got there as well, Ruddy. I didn't even know you had that bow. I would like to try one of those someday. 35/55 Gold Tip Pink Nugents @ 30"
"The older I get, the better I was" Byron Fergenson. "I lost arrows and didnt even shoot at a rabbit" Charlie after the Island of Trees. I just imagine you'll be thinking about it for a long time, Buddy - no matter how many more you might score on along the way, if your anything like me - because this one was a special one that you've really been "waiting" (and working) for. Psalm 37:4- "Delight thyself also in the Lord:and he shall give thee the desires of thine heart." Congrats on a nice harvest!